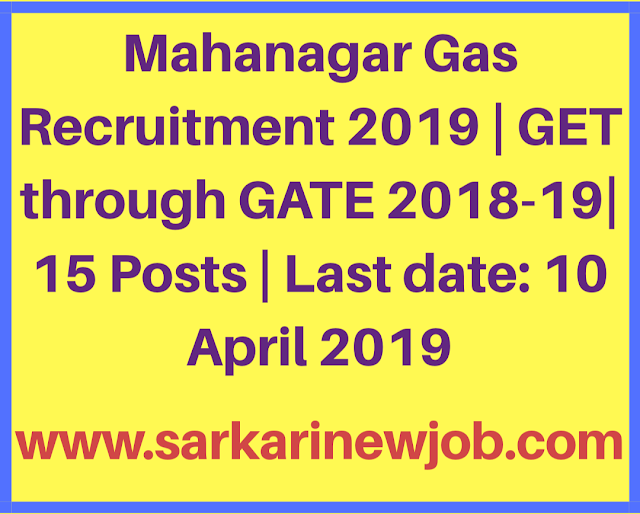 Mahanagar Gas Recruitment 2019 | GET through GATE 2018-19| 15 Posts | Last date: 10 April 2019 - Sarkarinewjob.com A ultimate job portal to provide employment news. Educational Qualification: Bachelor Degree in Engineering in Mechanical/ Electrical/ Civil/ Instrumentation with minimum 60% marks in Engineering degree and GATE Score for 2018 and/or 2019. · All qualifications must be from UGC recognized Indian University /UGC recognized Indian Deemed University or AICTE approved courses from Autonomous Indian Institutions. · Diploma in Engineering qualification (if applicable) should be recognised by respective State Board of Technical Education. · Candidates who have completed their Bachelor degree in Engineering in the year 2018/ Candidates who are currently in the final year (2018-19) of their Engineering Degree course are eligible to apply. · Candidates who have completed their Bachelor degree in Engineering in relevant discipline/ branch in the year 2017 or earlier are not eligible to apply. · MGL will be utilizing Graduate Aptitude Test in Engineering – 2018 & 2019 score (GATE 2018 & 2019 – Score) for recruitment of Graduate Engineer Trainees in the disciplines of Mechanical/ Electrical/ Civil/ Instrumentation. · Based on the GATE- 2018 & 2019 score and requirement, candidates will be shortlisted for Group Discussion and/ or Personal Interview for the position of Graduate Engineer Trainee in the above disciplines. Please note that only GATE- 2018 & 2019 score is valid for this recruitment exercise. GATE score of 2017 or prior to that is not valid. How to apply Mahanagar Gas Recruitment 2019 for GET?